Why listen to a recording that was recorded live almost a year ago? Because it is that good, and so is the live recording of the set (s). It is not often that a recording surfaces seemingly from out of nowhere and leaves even the most resistant listener breathless. 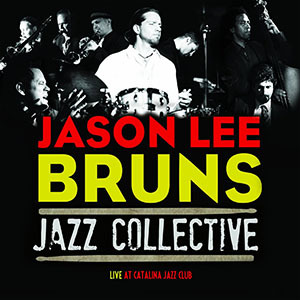 But Jason Lee Bruns and his Jazz Collective’s recording Live at the Catalina Jazz Club is a fine album indeed. The band is well-rehearsed and responsive and, as some composers believe, it takes an audience to complete a composition or compositions, this album is proof of that—a wonderful live recording and mixing done by none other than Joe Zawinul’s son, Ivan Zawinul (with some songs mixed and mastered in the studio by the Grammy Award winning Rich Breen). Then there is the leap of faith by the ensemble leader, drummer Jason Lee Bruns, who put it all out there. Not only are there wonderfully arranged instrumentals, but also vocals—some arranged, some written and arranged by the talented drummer; some by the spectacular vocalist, Kevin Bachelder. While all this could easily come apart, despite everyone’s best efforts, the opposite is true here: this is a recording to go back to time and time again. Jason Lee Bruns is a fine drummer. He proves this on the superb New Orleans strut, “Cissy Strut” and then again on the popular Brasilian chart, Antonio Carlos Jobim’s classic “So Danço Samba” on which the drummer plays a mean pandeiro; and then yet again on John Coltrane’s “Impressions”. And as if that were not enough, he goes on to reinvent the rhythm lines of “Autumn Leaves,” “Impressions” and “Bemsha Gandinga”. Obviously here is a rhythmic colourist who works beyond his drums set; with a palette and paint brushes as sticks and drumming brushes. His polyrhythmic inventions come from a head full of sounds. His capacity to be creative is truly impressive and Mr. Bruns is melodic to boot. This comes from the maturity of not simply having being born of Elvin Jones, but also Max Roach and Roy Haynes; and of course a propensity to invent and create magical structures and cycles. As proof there is “Impressions,” but there is also—and this is an important note to listeners—the beautifully angular “Bemsha Gandinga” in an arrangement that not only recalls a classic Thelonious Monk chart, but also pays reverent homage to the composer by playing with original fractured and angular rhythms that surely make Mr. Monk’s great composition Mr. Bruns’ own. And then there is the Jazz Collective itself. Here is a well-oiled machine, reminiscent of Elvin Jones’ Jazz Machine with Joe Farrell. But there is more. Kevin Bachelder gets much space to be himself and that means taking a leaf from Kurt Elling’s book and making it his own. Mr. Bachelder is such a fine tenor and used colour and timbre to such effect that he is impressive and threatens to steal the show from everyone else. But the pianist Mahesh Balasooriya will not be denied. His is a singular voice and Mr. Balasooriya is in superb form here. Jacques Voyemant on trombone is a revelation. This gentleman is so full of talent that it is hoped he will be listened to again and again. The same is true of guitarist Angelo Metz, who also sings rather well in Portuguese; trumpeter, Jason Gamer is just a good a horn player as anyone playing today. The trumpeter is a great listener and when called upon to solo he gives off his best. As is Kim Richmond, a very impressive saxophonist and the truly melodic bassist Edwin Livingston. And then this is a bold record by a drummer-leader who is willing to take risks without the proverbial safety net, and a band that is willing to follow. Track List: Cissy Strut; Autumn Leaves; Speak Low; It Could Happen To You; So Danço Samba; Impressions; Send in the Clowns; Waltz for Desmond; Bemsha Gandinga. Personnel: Kevin Bachelder: vocals; Mahesh Balasooriya: piano: Jason Lee Bruns: drum set, pandeiro; Jason Gamer: trumpet, flugelhorn; Edwin Livingston: upright bass, electric bass; Angelo Metz: Portuguese vocals, cuica; Kim Richmond: soprano and alto saxophone; Jacques Voyemant: trombone. Jason Lee Bruns (b. October, 3, 1979, Coldwater, Ohio) is an American percussionist, drummer, producer and educator specializing in Jazz, Brazilian, and Afro-Latin drum set styles. As either a drummer and/or percussionist Jason has been in the house bands for Beck, Lewis Price (The Temptations), Neil Sedaka, Liane Carroll (2x BBC Jazz Award Winner) and the L.A. Masters Coral. Jason has performed at L.A.’s top venues including Disney Hall, House of Blues, Herb Alpert’s Vibrato, Vitello’s, and Catalina Jazz Club. Jason has released six self-produced CD’s on his own label (Panout Music Group) most recently “Live at Catalina Jazz Club” preceded by “45 RPM”, “with Jason Gamer”, “The Egrem Session” “Lace”, his demo reel “Tapas”, and the single “Where I’m Going”. Jason holds a Bachelors of Music and a minor in composition from Miami University (Ohio), a Masters in Jazz Studies from the University of Southern California, performer’s certificates from the Mangueira Samba School (Brazil) and the International Folklore Laboratory (Cuba). Jason is also an AVID “Certified ProTools User” and is currently pursuing a Master’s Certificate in audio production from Berklee Music. 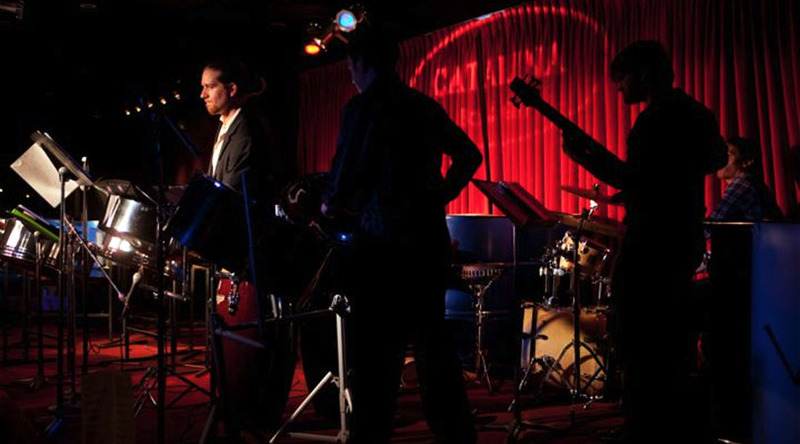 Jason has held an artist residency for the City of L.A. (“L.A.’s Best”), taught for USC “Jazz Reach” and is the founder of both the World Music and Recording Arts programs at Campbell Hall (North Hollywood, CA). These programs include two Steel Drum Orchestras, Brazilian Batería, Salsa Band and a State-of-the-Art/industry standard recording facility. As an author his method on teaching rhythmic notation was published by the Percussive Arts Society’s academic journal “Percussive Notes”. He is a member of the American Federation of Musician’s (Local 47), BMI, the Percussive Arts Society, and the Recording Academy (Grammy’s/NARAS). His music is available on iTunes, Amazon and CDBaby, and can be heard on Pandora Radio, Spotify, and L.A.’s KPFK 90.7FM.